A man of legendary charity and uncommon compassion, Saint Francis of Assisi has long been revered as the Patron Saint of Animals. Renowned for expressing his belief that all of creation is a sacred gift from God, he treated animals of every kind with the utmost reverence and respect, and came to earn a reputation as a friend and protector of all living things. 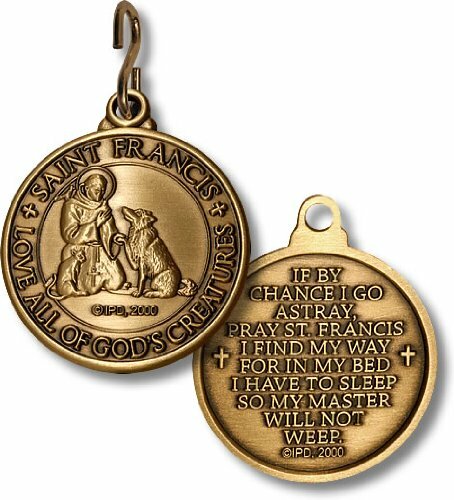 This specially minted pet tag commemorates St. Francis' legacy as the Patron Saint of Animals. The obverse features a rendering of Saint Francis and includes the words: "Saint Francis: Love of All God's Creatures." The reverse contains a prayer to Saint Francis. Struck in a brass alloy, this distinctive pet tag contains an antique bronze finish and comes complete with a bronze finished "S" hook, designed to attach firmly to your pet's collar.